At the time of this review there were nine books in the Dragonbreath series. The funny side of fear. This could have been a Fright Month selection in October because it’s all about fear and monsters and things that make children go Eek! 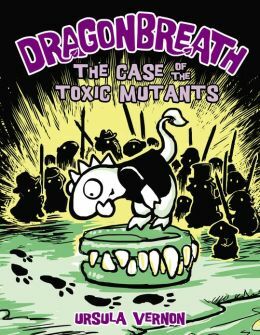 But Dragonbreath #9: The Case of the Toxic Mutants is also charming, funny and eccentric. The book invites reluctant readers in with a start similar to a comic book. Then it morphs rather quickly into text with depth and bright humor. The protagonist is a young dragon with some serious problems: he can’t get one good friend to believe he’s a real dragon, and he has to visit his grumpy old granddad, which is icky and frightening all on its own. A mystery of missing dentures quickly turns into a crazy-beast-and-ooze fest, sure to attract young boys in particular. The story is populated with characters and plot points that would otherwise give kids the chills. From pack rats followed down dank, dark tunnels to dog vomit slime mold, Vernon’s book allows the truly horrible to be comic. Much of the humor is the kind that appeals to both adults and kids, so this might be a good series to read together. And, be forewarned this skews to the older, more challenging chapter book. The publisher even lists it as ages 8—12. But the pictures, stories and anthropomorphized characters pull the appeal to the younger set as well. The illustrations are easy and free, and there’s a lot of green goo gliding through the pages. It all slides together quite nicely for a little monster mystery.